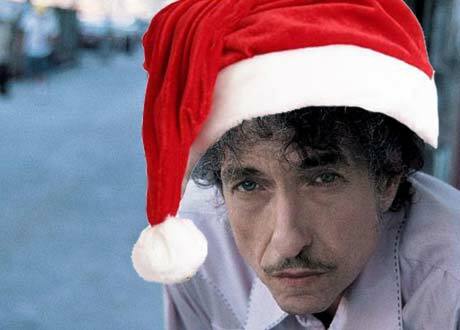 Bob Dylan Busy Recording Christmas Album? We may still be smack dab in the middle of summer but word has surfaced that the poet laureate of rock himself, Bob Dylan, is busy working away on an upcoming Christmas album. According to Bullypulpit.com, at least four songs have been recorded for the as-yet-untitled yuletide offering, including "Must Be Santa," "Here Comes Santa Claus," "I'll Be Home For Christmas" and "O Little Town of Bethlehem." All the tracks were reportedly laid down at Jackson Browne's Groove Master's Studios in Santa Monica, CA and, as a package, would mark Dylan's first album since this year's Together Through Life. "A Christmas album by Bob Dylan in the pipeline doesn't really shock me," Scott Marshall, author of a forthcoming book on the singer, God and Bob Dylan: A Spiritual Life, told Bullypulpit.com. "At first glance it may sound bizarre, but I don't think Dylan cares much about what his detractors might make of it. Dylan still sings songs from Slow Train Coming to this day and he's both never renounced being Jewish or renounced his experience with Jesus some three decades ago. He remains enigmatic and this will probably be talked about for years to come." At this point, there is no word if all the tracks on the album with be Christmas standards or if Dylan will throw a few originals into the mix as well. Also, a release date has not been set for the record, but it doesn't take a genius to figure out that it would drop sometime in November or December.